Airless paint spraying machines have a widespread use in all types of coatings applications. However when it comes to applying epoxy floor coatings there seem to be significant disagreements on whether or not we should be using airless sprayers. 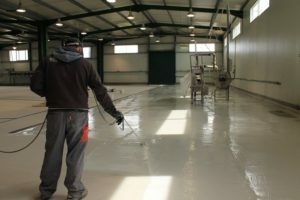 A few months ago I asked my network on Linkedin: Are we for or against applying floor coatings with an airless sprayer? The results were fascinating as I got dozens of responses from all over the world arguing for and against the use of airless sprayers on floor coatings. So I have compiled a list of the advantages and disadvantages based on the feedback that I received as well as from my personal experiences. Please note that article focuses on floor coatings and specifically thin floor coatings. In other words we are discussing if airless sprayers can replace rollers and squeegees in such applications. 1. The most obvious advantage of using a sprayer is productivity. 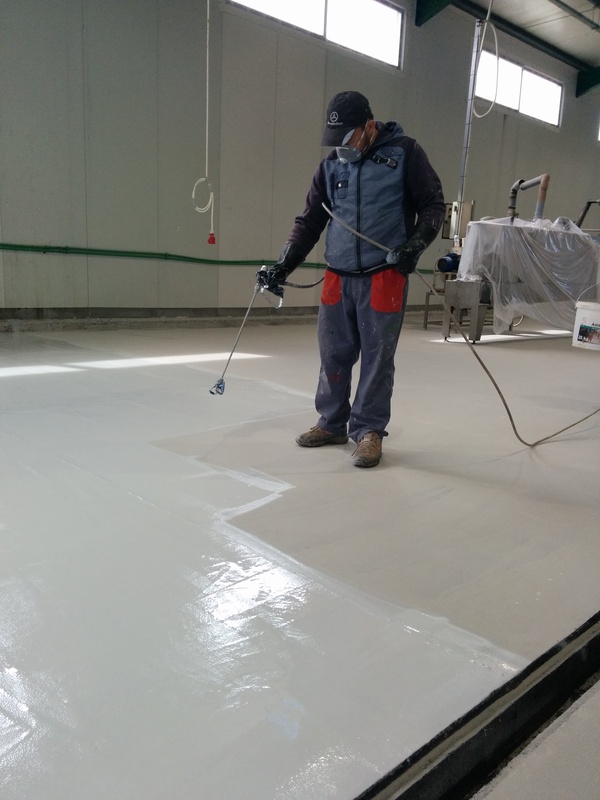 A team of four equipped with an airless spray machine can deliver thousands of square meters of a thin epoxy coat in a very short period of time. If you have large surface areas to cover, you will deliver the project in a much shorter time frame and you can save significant labour costs in the process. 2. The appearance of the final film finish. Airless sprays can create a beautiful smooth film on the final coat free of orange-peel texture. You simply cannot deliver such results using a conventional application method like a roller or squeegee. Now these two advantages can sound very convincing for someone to prefer the use of a sprayer. However the respondees were quick to point out the many disadvantages and risks that airless sprayers pose. 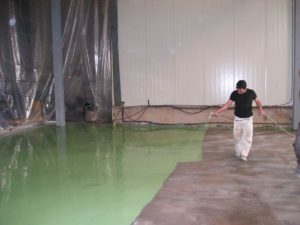 Solvents, solvent, solvents – In order to get epoxy coatings to come out of an airless machine you need to thin down the product. 100% solids products simply won’t work. 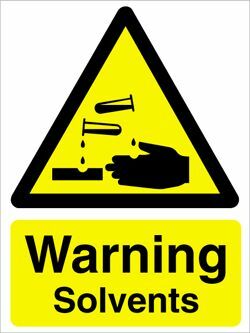 You will therefore need to add significant quantities of solvents (if the product doesn’t already contain solvents) to get the sprayer to work properly. A high amount of solvents on a large surface area can cause all sorts of problems from inhalation problems, skin problems but also overall health and safety issues such as an increased risk flammability during the application. Equipment Malfunction – Airless sprays are notorious for breaking down or malfunctioning when you need them most. There is nothing worst than the spray gun clogging up and producing an ugly finish. I have personally seen a sprayer leave ugly drip marks on the surface leading to unhappy customers asking questions. Operation of such a machine requires trained workers who can understand how pressure valves and circulation of the coatings work. So what are your thoughts on airless sprayer? 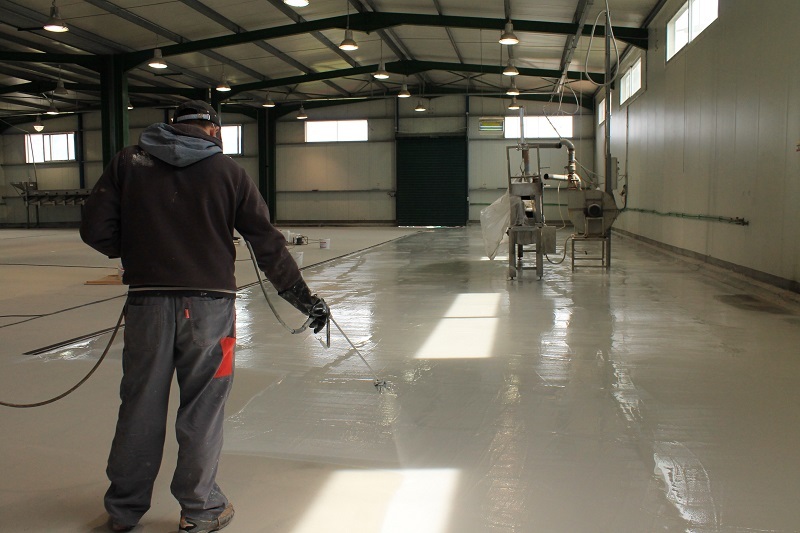 How often do you use airless sprayers in your flooring projects? Do you believe that the advantages outweigh the disadvantages?